Are you a driver looking for a truck that’s suited for adventuring off the main road? The Toyota Tacoma is designed with a full array of off-road features that make it great for taking it out onto a trail. 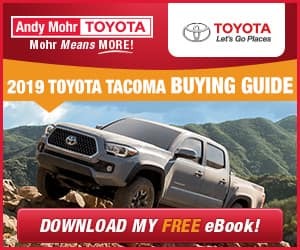 To show Avon, Indianapolis, and Plainfield drivers what this truck can do, we’ve compiled this eBook to highlight the standout features and capabilities of the 2019 Toyota Tacoma. Our team at Andy Mohr Toyota is eager to present this truck’s features to Avon, Indianapolis, and Plainfield truck enthusiasts. If you’re interested in learning more about the Toyota Tacoma, download this free eBook today.